When Leonardo talks about a well-employed life, he doesn’t meant a stable job at a respected company. Instead, his maxim touches on the need to spend your time on things that truly matter. After reading Walter Isaacson’s biography Leonardo da Vinci, I’ve put together a list of things I learned from Leonardo da Vinci. Because he certainly led a well-employed life. 1. Don’t let things outside of your control impact your potential. Leonardo da Vinci is universally regarded as one of history’s greatest artists, thinkers, and embodies the term Renaissance Man. But Leonardo didn’t live the charmed upbringing you would assume. He was born “illegitimo”, his parents unmarried and raised by a combination of parents, uncles and family friends. “Leonardo had almost no schooling and could barely read Latin or do long division”, describes Isaacson. He wasn’t allowed to be trained in his father’s profession as a notary because his parents weren’t married. I find Leonardo’s lack of formal education and non-traditional family reassuring. Leonardo didn’t rely on the status of his family or a top notch education to define his potential. Instead, he fostered an insatiable curiosity to catapult himself to the man he would become. 2. Be constantly curious and dig deep into that curiosity. Leonardo was a genius. No, not a genius painter, or scientist, or engineer. Sure, he was world-class at all of things. But when you look at why Leonardo was world-class at those things, it’s because to one thing: his curiosity. He had a genius curiosity and made it his life’s work to dig deep into those curiosities. “By allowing himself to be driven by pure curiosity, he got to explore more horizons and see more connections than anyone else of his era,” explains Isaacson. My gut reaction after witnessing this level of curiosity is to feel embarrassed. It makes my to-do list of “buy paper towels” and “write a blog post about Leonardo da Vinci” feel pretty lame. But pushing aside the direct comparison, Leonardo’s lists is an inspiration. How can I be more curious in everyday life and how can I dig deep into those curiosities.? 3. You don’t have to be an expert in just one thing. Learn new skills. If someone asked you what Leonardo da Vinci “was”, what would you say? A painter or artist, right? The funny thing is that Leonardo listed painting dead last in his skill set self-evaluation. 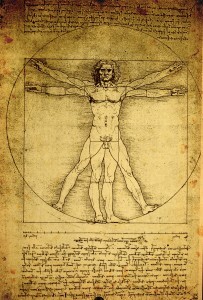 Throughout his life, da Vinci explored a wide range of studies, including “anatomy, fossils, birds, the heart, flying machines, optics, botany, geology, water flows, and weaponry.” Isaacson classifies him as the “archetype of the Renaissance Man” and I couldn’t agree more. How can we put this into practice? If you’re in college, try to study across multiple disciplines. Pair that biology major with a business major. Studying engineering? Why not expand your learnings to the arts. Out of college? Don’t limit your learnings to that in your immediate field. Always be on the lookout for new skills to learn. Also consider where you live. Does your community have a culture of expertise that spans multiple disciplines? It’s not just a matter of living in a big city. Some big cities focus on a single industry while smaller ones have a wider range of experience. The people around Leonardo served as both a stoker to the fire of Leonardo’s curiosities and a way to satiate those burning questions. Leonardo maximized his ability to learn by associating with fellow deep-thinkers and finding a way to learn from every encounter. “Unlike Michelangelo and some other anguished artists, Leonardo enjoyed being surrounded by friends, companions, students, assistants, fellow courtiers, and thinkers. In his notebooks we find scores of people with whom he wanted to discuss ideas. 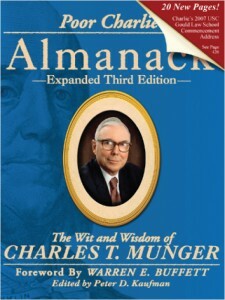 His closest friendships were intellectual ones,” describes Isaacson. But da Vinci wasn’t satisfied with learning from only his close friends. “He would grill people from all walks of life, from cobblers to university scholars, to learn their secrets,” says Isaacson. Always be on the lookout for people you can learn from. Leonardo wasn’t “normal” by societal standards and he didn’t give a damn. Don’t be afraid to be yourself. I think da Vinci’s comfort with his true self allowed him to unlock his creativity. So be like Leonardo and be your true self. But just as importantly, let others reach their own potential by expressing their own identity. 6. Write it down and share what you write. My friend Ethan and I used to say “write this down” whenever someone said something funny or interesting with the hopes of remembering it forever. Guess what? Neither of us wrote much of anything down. The result: fragmented memories of our experiences. The second part of this lesson is to share what you write. This lesson was learned based on one of da Vinci’s shortcomings. His notebooks contained a trove of discoveries that didn’t make it’s way into the public realm until decades or centuries after their writings. 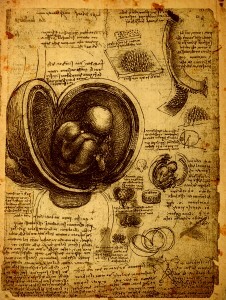 Numerous anatomical, engineering, and artistic discoveries made by da Vinci were not widely known because he was not enthusiastic at publishing his work. It was a catch-22 of his curiosity. He moved onto new topics before his thoughts were organized into writings that could be consumed by the masses. So be curious, but also take the time to share your results with the world. 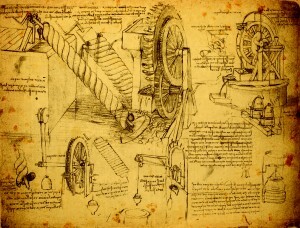 Da Vinci spent most of his life dreaming up incredible feats of human ingenuity: flying machines, armored vehicles, and the ideal city design to name a few. Yet he found true inspiration from nature’s simplicity. In fact, many passages in his notebooks draw parallels between man and nature. “Man is the image of the world”, he wrote. But simply saying that da Vinci found inspiration is a poor description of how he viewed man and it’s place amongst nature. Leonardo did not simply classify nature and man as separate entities loosely impacting each other – they were deeply intertwined. Nature was the foundation of man. 8. Nothing is ever finished. Continually improve upon the old. This was extremely frustrating to both the Renaissance patrons who paid for finished pieces da Vinci art and the modern day historians who dream to see his notebook pages come to life. It would be easy to see this as a negative in today’s world of “ship it’ and “don’t let perfect get in the way of good.” Most of the time I agree with these modern principles. 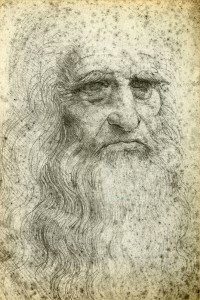 As da Vinci’s curiosities were satiated, he learned new techniques that could be applied to old ideas. It was common for his notebook pages to have scribbles in the margins years later with updated thoughts and modifications. We know more than we did yesterday. So use that to your advantage and continually build on your earlier work. 9. Don’t worry about what you’ve accomplished so far. And yes, if I’m being honest, I may have included this lesson to make my 32 year-old self feel better that Leonardo wasn’t Leonardo until he was well into his thirties. But on a less personal level, da Vinci struggled through most of his life to find patrons to fund his life (translation: he sometimes struggled to pay the bills). So just because you haven’t reached the height of your envisioned success today doesn’t mean you never will. Because maybe you’re a little more like Leonardo than you think. The most meaningful things are said in the doorway as we’re about to leave. In passing. When we’re leaving a long dinner with friends, after a weekend with our parents, or in the hallway after a meeting. Why do we wait until we’re walking out the door to say how we really feel? It’s easier. Our comments have less gravity when we say it in passing. There’s no time for a deep conversation on the topic if we’re about to hop in the car. It comes across as more casual when we say it as we’re putting on our coats. When we delay saying how we feel, we’re denying a heartfelt conversation and stifling the relationship. So say it now. Tell your friend what you’re thinking during appetizers. Call your parents and say what’s on your mind. Walk over to your coworkers desk and give her feedback. Don’t wait until you’re walking out the door. Volume 2 in the “Reading, Listening, Watching” series inspired by the NYT Sunday Feature Download articles. Brain.fm is a music streaming service I’ve been using to help concentrate and “get in the zone”. I use music to drown out distractions but sometimes the music itself is a distraction. Brain.fm isn’t music as much as it’s….sound. In Brain.fm’s words: “each brainwave session is designed using specific, high frequency protocols that have been found to be highly effective in a clinical setting”. Translation: they use science to help you focus, relax, and sleep better. Count me in! Give it a shot for yourself. 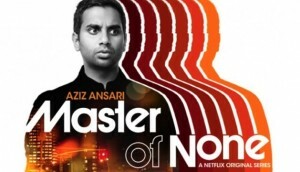 Aziz Ansari’s Master of None. As a long time fan of Aziz’s standup, it’s exciting to see him jump into a new medium. Aziz co-wrote the Netflix series and also stars as a 30-something actor in NYC navigating through life. It’s a funny take on modern romance, city living, and finding your true calling. I watched the entire 10-episode series in one weekend. As a bonus, this old video of Aziz is incredible. What are you reading, listening, and watching?